A working Victorian village carpenter’s workshop powered by a 14′ detached overshot wheel. Ty Coch is believed to be the only fully operating, privately owned water driven sawmill and carpenter’s workshop in the United Kingdom. The property was bought in 2005 by Tim Chilton who now runs the mill as a bed and breakfast. The traditional timber-frame Welsh longhouse now forms the accommodation of the bed and breakfast and dates from around 1650. The original byre attached to the longhouse is run as a shop, selling antiques and bygones. Alongside the longhouse lies the award winning Pontdolgoch sawmill and carpenter’s workshop. 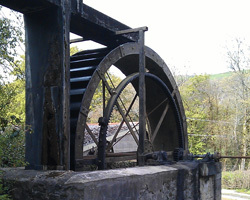 The sawmill is powered by a fully operational overshot waterwheel, supplied from the millpond on the slope above. The mill is over a hundred years old, built at the turn of the last century to replace the previous mill that once stood on this site. It is intact and untouched, still operating as it did over a century ago. We are always happy to give demonstrations of the sawmill on request.